Uzbek President Islam Karimov is in intensive care after suffering a brain haemorrhage, his daughter says. "His condition is considered stable" and "it is too early to make any predictions about his future health," Lola Karimova-Tillyaeva wrote on her Instagram account. Ms Karimova-Tillyaeva pleaded for people to "refrain from speculations". Mr Karimov, 78, has been leader of the former Soviet republic since before independence in 1991. 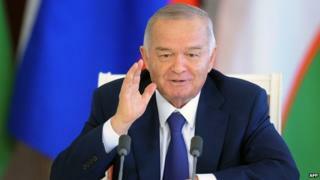 In an unusual move on Sunday, the Uzbek government admitted he was receiving treatment but did not give details. The BBC's Abdujalil Abdurasulov says that the announcement caught many by surprise in authoritarian Uzbekistan, a country where any information about the president's health is treated like a state secret. President Karimov is known to have had health issues, but the government has never previously issued a statement about his health. It has become a tradition in Uzbekistan for the president to dance during major holiday festivities. By doing so Mr Karimov sends a message to the nation that he is fit and healthy. Everyone was expecting the president to attend Independence Day celebrations - perhaps the government's confirmation that he is in hospital was a necessary move to prepare the public for his non-appearance. Tashkent-based human rights campaigner Surat Ikramov says that most people are too afraid to talk openly about Mr Karimov's hospitalisation in one of the most repressive countries in the world. "Any vocalisation that Mr Karimov's power is not absolute is seen as a threat to the entire system," says Human Rights Watch spokesman Steve Swerdlow. "Even if he survives this illness or whatever it is, this is an acknowledgement of [Mr] Karimov's mortality, and of the fact that the system is about to change." The Kremlin said on Monday that it deeply regretted Mr Karimov's illness. It refused to comment on whether there was concern in Moscow that it could enflame uncertainty in Central Asia's most populous country, which borders Afghanistan. "The Kremlin wishes a quick recovery to the president of Uzbekistan," spokesman Dmitry Peskov said. "We would like to receive only positive news about the president's health." Mr Karimov was last seen on state TV on 17 August, meeting the South Korean interior minister. Independence Day celebrations - which the president would always attend - are to be held on 1 September. In her message, Ms Karimova-Tillyaeva, who serves as Uzbekistan's ambassador to Unesco in Paris, asked people "to show respect to our family's right to privacy". There have been a number of occasions when the president was rumoured to have a stroke or a heart attack. The last time it happened was just before the 2015 presidential election, when Mr Karimov was not seen in public for several weeks - fuelling rumours about his poor health.